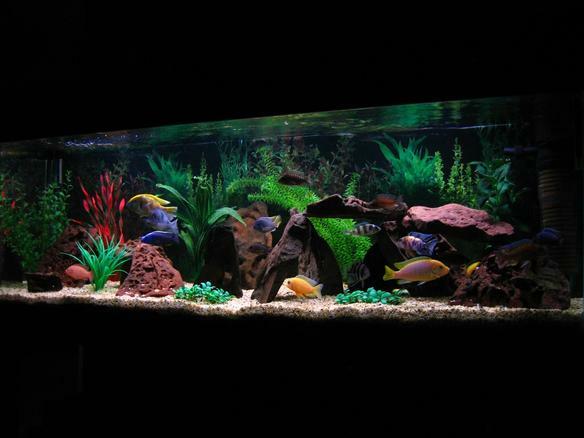 75 gallons freshwater fish tank (mostly fish and non-living decorations) - My 5ft African Cichlid tank. 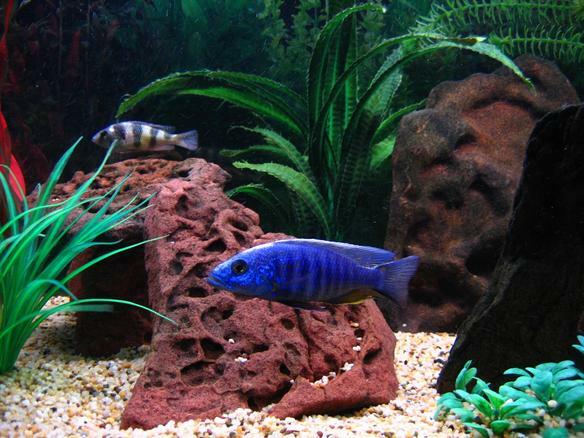 freshwater fish - sciaenochromis fryeri - electric blue hap stocking in 75 gallons tank - The biggest poser in my tank is one of my Electric Blues picture here in the front with my Zebra Obliquidens in the background. 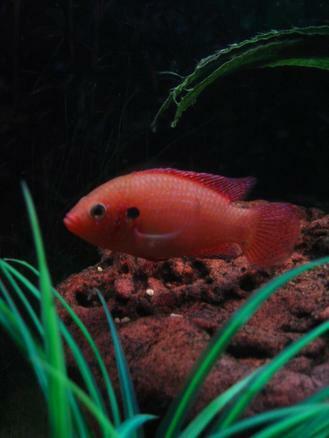 freshwater fish - hemichromis bimaculatus - jewel cichlid stocking in 75 gallons tank - Red Forest Jewel. 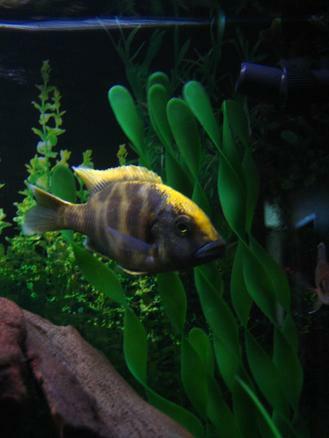 freshwater fish - nimbochromis venustus - venustus cichlid stocking in 75 gallons tank - My Venustus. The leader and the biggest my tank. freshwater fish - cyphotilapia frontosa - frontosa cichlid stocking in 75 gallons tank - ( Left to right) Back end of Marble Peacock, Zebra Obliquidens, Acei, Electric Yellow, Red Top Zebra, Jacobfrebiergi, Frontosa, Blue Dolphin, Venustus, Demasoni. freshwater fish - cyrtocara moorii - blue dolphin cichlid stocking in 75 gallons tank - (Left to right) Venustus, Electric Blue, Blue Dolphin, Dragonblood Peacock. freshwater fish - maylandia hajomaylandi - hajomaylandi stocking in 75 gallons tank - Hajomaylandi with Electric Yellow behind & Livingstoni in the background. freshwater fish - pseudotropheus demasoni - demasoni cichlid stocking in 75 gallons tank - Demasoni, my little terror with Eureka Red Peacock. 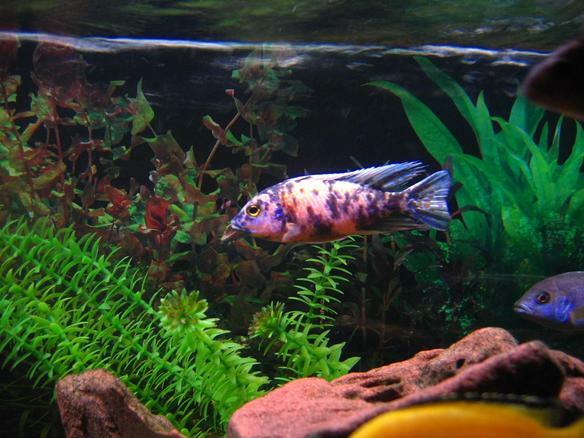 freshwater fish - aulonocara nyassae var. 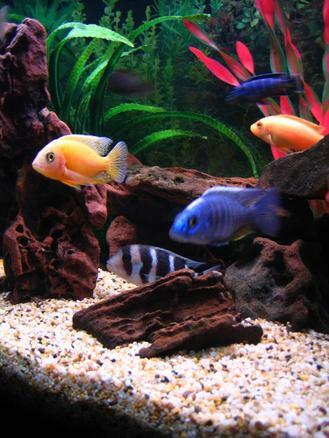 - peacock cichlid, orange blossom stocking in 75 gallons tank - Dragonblood Peacock, Zebra Obliquidens, Marble Peacock, Cobalt Blue. 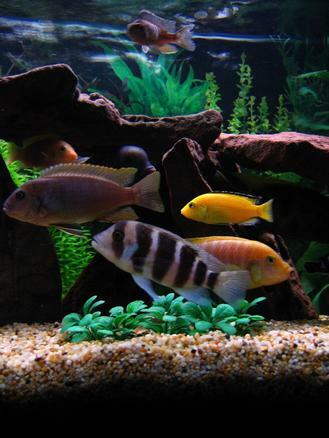 freshwater fish - cyphotilapia frontosa - frontosa cichlid stocking in 75 gallons tank - Red Top Zebra, Red Zebra, Blue Dolphin, Jacobfrebiergi, Frontosa, Hajomaylandi, Electric Yellow. 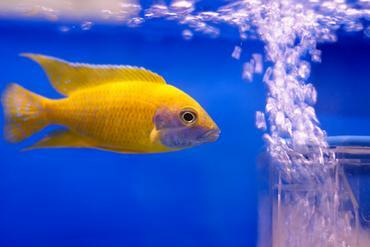 freshwater fish - nimbochromis venustus - venustus cichlid stocking in 75 gallons tank - Getting hungry! 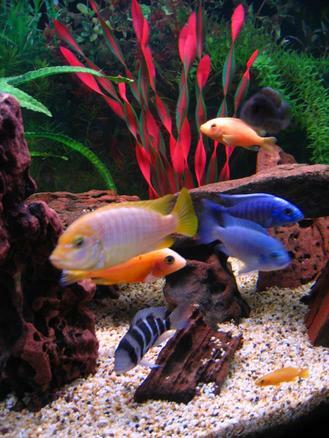 (Left to right) My 2nd Electric Blue who has almost fully changed colour, Venustus, Acei, Hajomaylandi, Blue Dolphin & Demasoni. 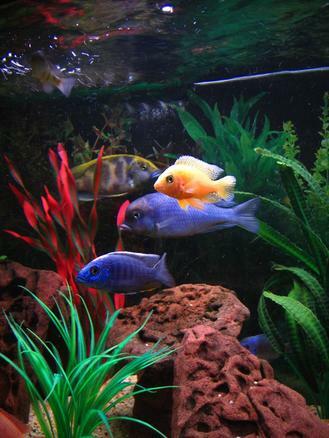 freshwater fish - maylandia hajomaylandi - hajomaylandi stocking in 75 gallons tank - (Left to right) Electric Blue, Leleupi, Hajomaylandi, Frontosa, Electric Yellow, Stuartgranti, Dragonblood Peacock, Venustus, Electric Blue. 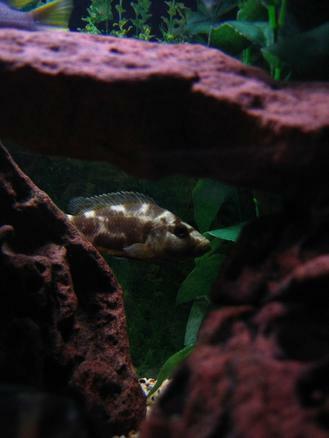 freshwater fish - cyphotilapia frontosa - frontosa cichlid stocking in 75 gallons tank - Frontosa trying to hide. 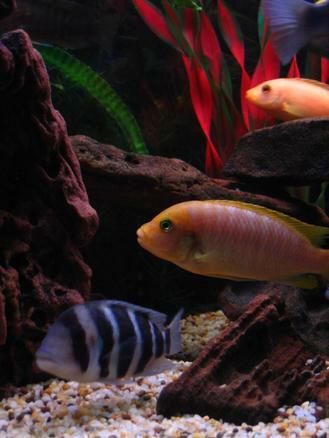 freshwater fish - pseudotropheus acei - acei cichlid stocking in 75 gallons tank - Acei with Red Zebra in the background. 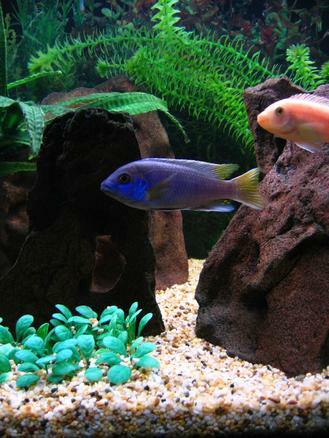 freshwater fish - aulonocara nyassae var. 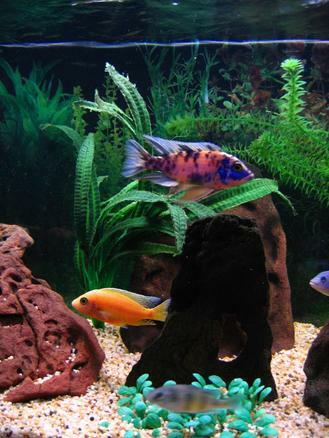 - peacock cichlid, orange blossom stocking in 75 gallons tank - My Marble Peacock with my Acei sneaking into the shot. freshwater fish - nimbochromis livingstonii - livingstoni stocking in 75 gallons tank - My Livingstoni hiding in the background. freshwater fish - maylandia hajomaylandi - hajomaylandi stocking in 75 gallons tank - There's always one fish that moves when you are trying to take a photo isn't there... (Left to right) Frontosa, Blue Dolphin, Electric Blue,Stuartgranti, Compressiceps, Hajomaylandi, Cobalt Blue, 2nd Electric Blue, Red Zebra, Leleupi. 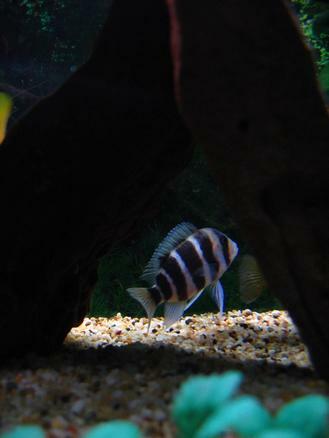 freshwater fish - aulonocara sp. 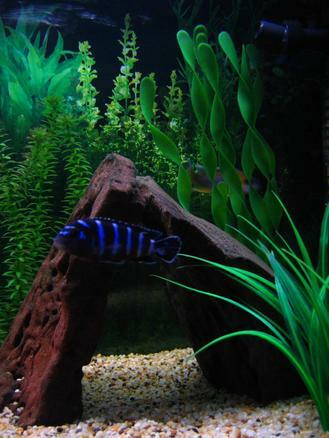 - dragon blood peacock stocking in 75 gallons tank - Dragonblood Peacock & Electric Blue front, Frontosa underneath, Mbamba being chased by my Demasoni rear and Red Zebra. 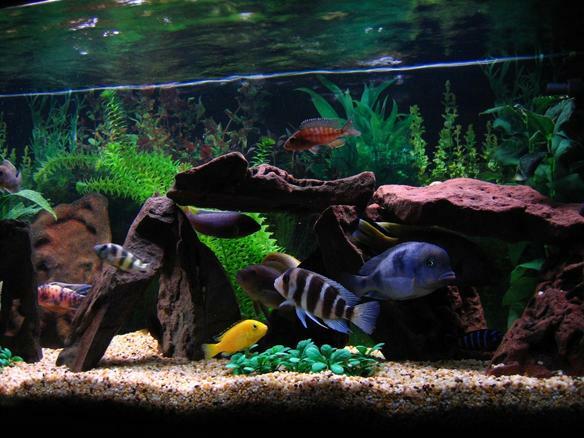 freshwater fish - maylandia hajomaylandi - hajomaylandi stocking in 75 gallons tank - Frontosa, Hajomaylandi & Red Zebra. 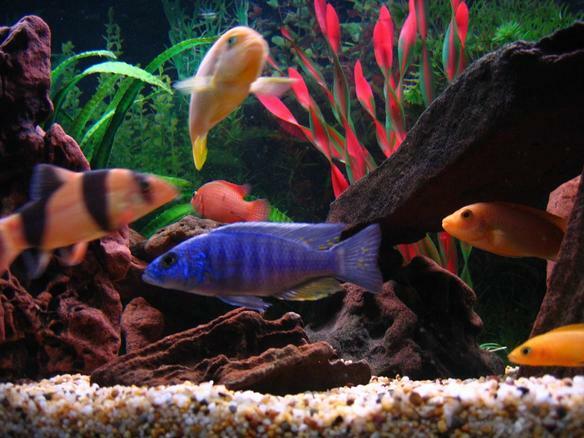 freshwater fish - sciaenochromis ahli - electric blue cichlid stocking in 75 gallons tank - (Left to right) Clown Loach, Electric Blue, Red Forest Jewel, Hajomaylandi, Red Zebra & Leleupi. 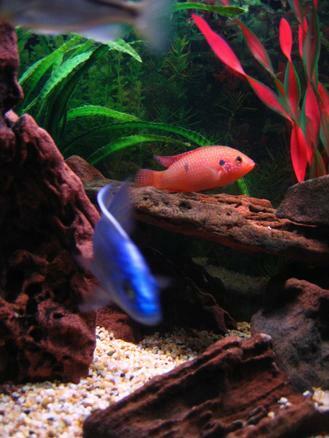 freshwater fish - hemichromis bimaculatus - jewel cichlid stocking in 75 gallons tank - Red Forest Jewel with my Electric Blue in front. 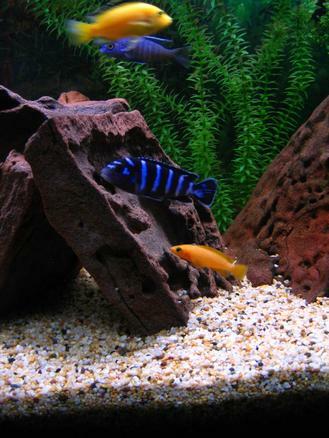 freshwater fish - pseudotropheus demasoni - demasoni cichlid stocking in 75 gallons tank - (Top to bottom) Electric Yellow, Electric Blue, Demasoni & Leleupi who passed on while I was away on holidays. 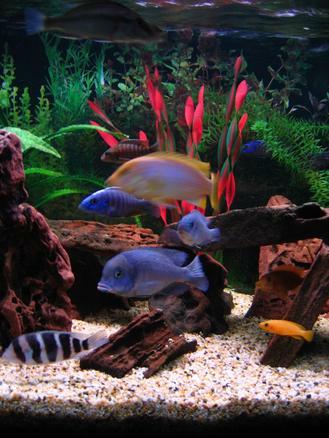 freshwater fish - maylandia hajomaylandi - hajomaylandi stocking in 75 gallons tank - Fish on parade. 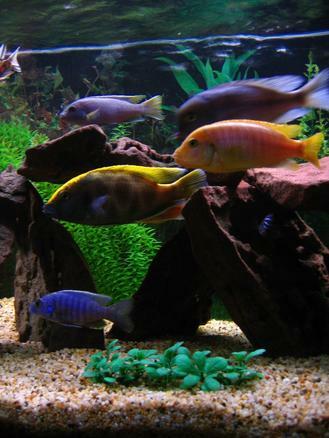 ( Left to right ) Hajomaylandi, Dragonblood Peacock, Frontosa, Cobalt Blue, Electric Blue with Red Zebra & Stuartgranti above & Leleupi underneath. 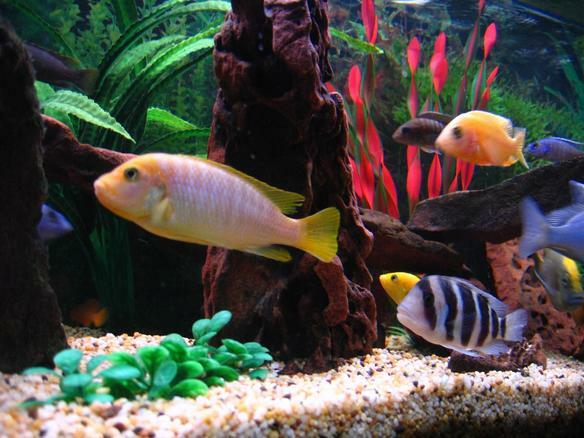 Photo Caption: My fat Clown Loach. 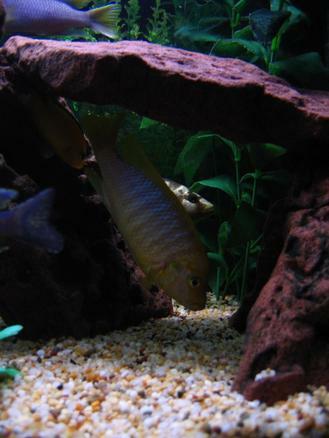 He's a bit light in colour than his usual cos it's feed time and he gets a bit nervous with all the other fish around. This picture has been rated : 27 times. 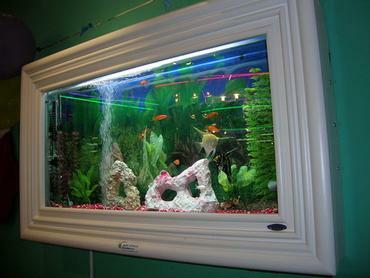 Description: 5ft tank: 152.5cm long x 40.5cm wide x 50cm high. 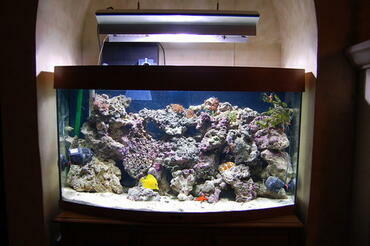 300W Aqua One Heater, Ehiem Classic 2217 external filter, Otto internal filter, single globe 5ft flourescent lighting.